The experts at IHS Automotive frequently recognize Subaru as being among the longest lasting vehicles on the road, which is a testament to the precision engineering behind every Subaru part and accessory. Here at Carter Subaru Ballard near West Seattle, WA, we are always updating generous specials on the genuine Subaru parts and accessories you need to get the most from you Subaru. When it comes to the exceptionally high quality found in every Subaru model, it only makes sense to trust our genuine Subaru parts and ensure that you are getting the same high level of quality that your Subaru came with from the factory. Our knowledgeable parts professionals can provide a wealth of information so you will be confident in getting the best deals on the right parts. We are conveniently located near Bainbridg Island, WA, so drop by and don't forget to check back often for the next great deals. Subaru is one of the fastest growing brands on the market thanks to exceptional value and remarkable quality. When you need parts and accessories for your Subaru, our Parts Department here at Carter Subaru Ballard is the place to go. Be sure to check in often as we are always updating our exciting specials--and if you need help putting your new parts on, you will find some of the best factory trained technicians around in our Service Department. Keeping up with the maintenance and repair on your ride is easy with updated specials available to Tukwila, WA and beyond. When the time comes for your next vehicle, be sure to check out the updated specials we have on our huge inventory of new Subaru models, or consider a certified pre-owned Subaru model. We even have a wide variety of quality used cars available to Bainbridge Island, WA, and every vehicle on our lot is marked with the no-hassle price. 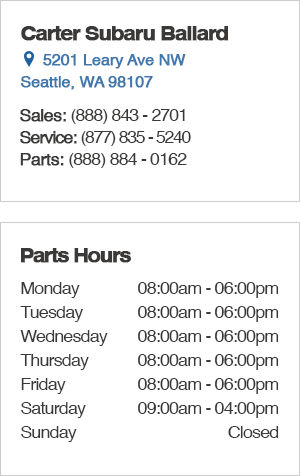 Order your parts easily online or give us a call at (877) 884-0162. We are conveniently located at 5201 Leary Ave. NW, Seattle, WA 98107, and we look forward to earning your business.